“Pigeons do just as well as humans in categorizing digitized slides and mammograms of benign and malignant human breast tissue,” said Richard Levenson, professor of pathology and laboratory medicine at UC Davis Health System and lead author of a new open-access study in PLoS One by researchers at the University of California, Davis and The University of Iowa. 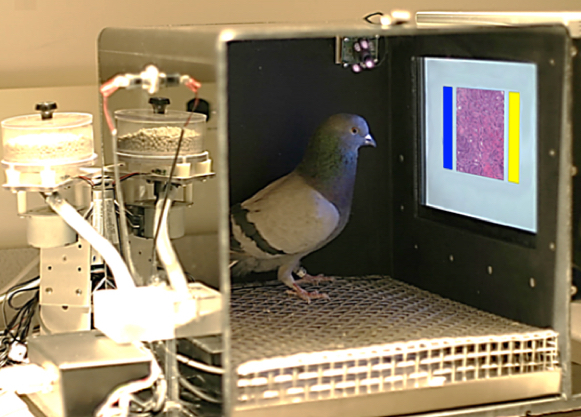 For the study, each pigeon learned to discriminate cancerous from non-cancerous images and slides using traditional “operant conditioning,” a technique in which a bird was rewarded only when a correct selection was made; incorrect selections were not rewarded and prompted correction trials. Training with stained pathology slides included a large set of benign and cancerous samples from routine cases at UC Davis Medical Center. 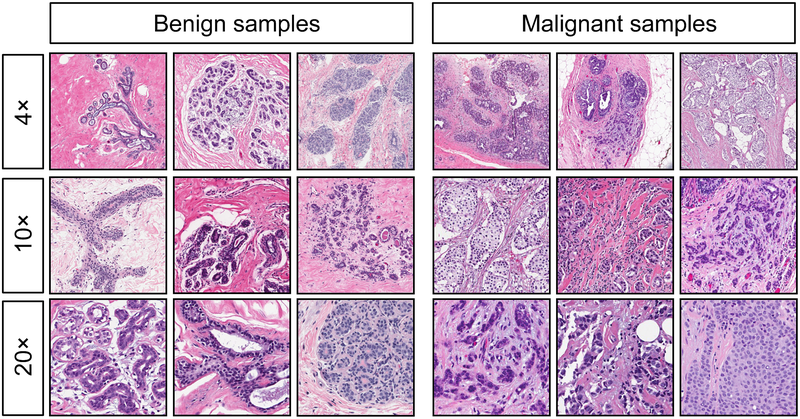 “The birds were remarkably adept at discriminating between benign and malignant breast cancer slides at all magnifications, a task that can perplex inexperienced human observers, who typically require considerable training to attain mastery,” Levenson said. He said the pigeons achieved nearly 85 percent correct within 15 days. “When we showed a cohort of four birds a set of uncompressed images, an approach known as “flock-sourcing,” the group’s accuracy level reached an amazing 99 percent correct, higher than that achieved by any of the four individual birds.” Wasserman has conducted studies on pigeons for more than 40 years. After years of education and training, physicians can sometimes struggle with the interpretation of microscope slides and mammograms. Levenson, a pathologist who studies artificial intelligence for image analysis and other applications in biology and medicine, believes there is considerable room for enhancing the process. This work also suggests that pigeons’ remarkable ability to discriminate between complex visual images could be put to good use as trained medical image observers, to help researchers explore image quality and the impact of color, contrast, brightness, and image compression artifacts on diagnostic performance. Pathologists and radiologists spend years acquiring and refining their medically essential visual skills, so it is of considerable interest to understand how this process actually unfolds and what image features and properties are critical for accurate diagnostic performance. Key insights into human behavioral tasks can often be obtained by using appropriate animal models. We report here that pigeons (Columba livia)—which share many visual system properties with humans—can serve as promising surrogate observers of medical images, a capability not previously documented. 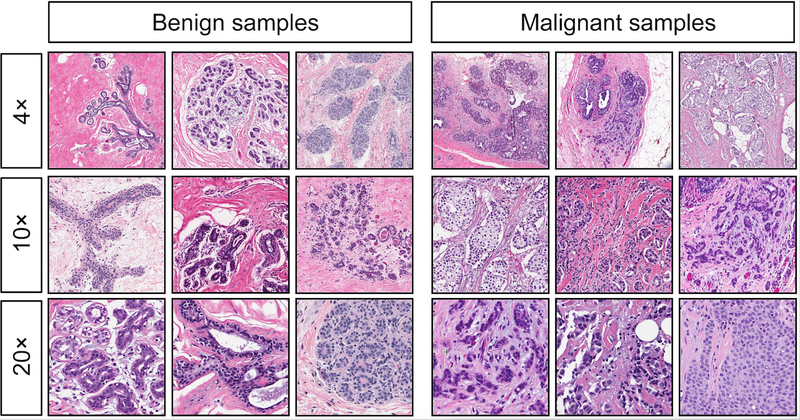 The birds proved to have a remarkable ability to distinguish benign from malignant human breast histopathology after training with differential food reinforcement; even more importantly, the pigeons were able to generalize what they had learned when confronted with novel image sets. The birds’ histological accuracy, like that of humans, was modestly affected by the presence or absence of color as well as by degrees of image compression, but these impacts could be ameliorated with further training. Turning to radiology, the birds proved to be similarly capable of detecting cancer-relevant microcalcifications on mammogram images. However, when given a different (and for humans quite difficult) task—namely, classification of suspicious mammographic densities (masses)—the pigeons proved to be capable only of image memorization and were unable to successfully generalize when shown novel examples. The birds’ successes and difficulties suggest that pigeons are well-suited to help us better understand human medical image perception, and may also prove useful in performance assessment and development of medical imaging hardware, image processing, and image analysis tools.